So I planted mine in February, I know it’s a tad early but I really wanted to make sure at some point this year I can have one of those posts. And now I am giving you fair warning, at some point this summer I am going to make a wonderful tomato salad with basil from my very own garden – you may be jealous, so start planting now! Because I have never really grown anything longer term than a salad leave or cress, I wanted to start early and small. If it all goes wrong with my first attempt I still have a fair amount of time to start again. I wanted to go varieties slightly different from the vegetables I could buy in the shops. Since I don’t see myself being self-sufficient in the garden any time soon, it seems the best plan to grow things I can’t buy. So the tomatoes are of small yellow variety, and the strawberries are also a smaller alpine variety. While sweet basil is by no stretch of the imagination hard to come by, fresh herbs are expensive. You can either buy one of those plants which die off super quickly – or you buy the pre-cut stuff, which I always tend to find in the bottom of my fridge after it’s way past its best. Growing my own means I can just cut some when I need it, and it will always be fresh. While it still early days for my vegetable patch (i.e. 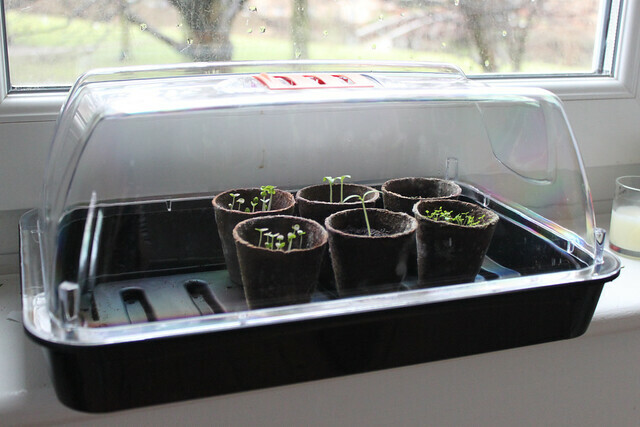 I have yet to dig out any space for it) I have the seeds growing in some tiny pots in a non-heated seed propagator and they are starting to do quite well. 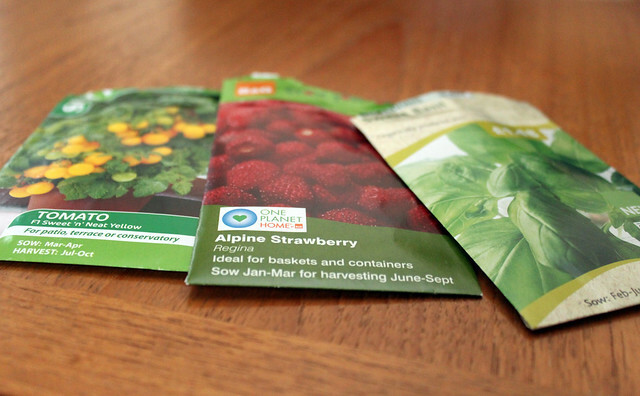 From L to R: Basil, Tomato, Alpine Strawberries. I then took photos again this afternoon (Saturday the 12th of March) and look how much they have grown! My strawberry seeds are starting to germinate now. What are you growing this year? What worked last year? Any suggestions / helpful hints and links for a beginner such as myself? I’d love to hear from you.